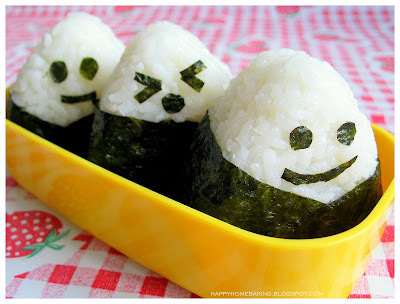 Whenever I run out of idea what to prepare for lunch, I will just make some Onigiri or Japanese rice balls. These are just so simple to make...you will only need to cook some Japanese rice or use any short-grain rice like CalRose. I made these Salmon Onigiri with a brand of Australian CalRose rice...which I spotted on a supermarket shelf. I bought it to try as it's available in a 1 kg small pack. 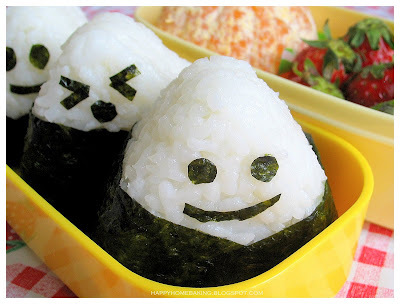 One good thing about onigiri is that you don't have to add any sushi vinegar to the rice, it takes away the hassle of mixing the rice and fanning it at the same time...you will know what I mean if you have tried making sushi rice. In order to make good onigiri, there is this extra step which I'll follow, that is, after washing the rice, I will drain away the water, and set the rice aside for 30mins to an hour. When ready, I cook it with a rice cooker...using the ratio of 1 cup of rice to 1 cup of water. Just like cooking our usual long grain rice, I will not open the lid until 10-15mins after the rice has been cooked. I'm not really sure what's the reason behind, but it has long became my habit to do so. The salmon fillings is very easy to prepare too. You will only need to season the salmon with some salt and/or ground pepper...pan fried it till cooked and flaked it with a fork. I used the salmon fillings in two ways. I used some to wrap inside the rice balls, and the rest I mixed them with rice, some black sesames, and some furikake (Japanese rice seasoning), before shaping them with a set of onigiri rice mould. I dressed up an otherwise plain looking rice ball with seaweed, and with a kitchen scissors I cut out some eyes and mouths. I thought they look like little men in tuxedos?! My kids love rice balls...especially those I made using fillings such as pork floss or otah ;) We find these salmon version a little bland on it's own...so we dipped them in some Japanese soya sauce. Ha, these are precious! An aesthetically-pleasing and yummy lunch. I love it. It's really an eye-catching photos ! 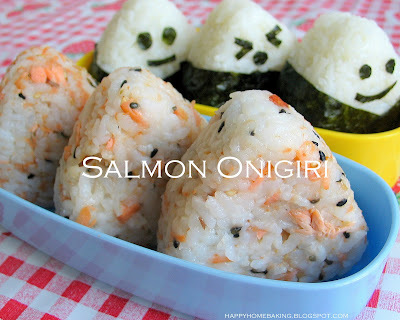 The salmon onigiri is also an easy-to-make riceballs. 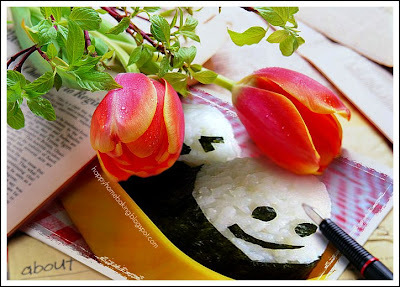 The rice balls look very cute. I love it. I make salmon onigiri whenever I'm too lazy too cook. I steam the salmon instead. Also, I add ikan bilis powder for extra flavour. Like the idea of adding pork floss as fillings. Will do that next time, I believe my kids will love them too. Very cute, what a good idea for lunch boxes. Yes, if your filling is too much, the rice will not keep it's shape. What I do is, after adding some rice in the mould, I will use a spoon to make a hole in the middle, add the fillings in the hole to keep it in the centre, then cover with rice. Press the mould down real hard to compress the rice. If you find that the onigiri is still too loose, you can compress it further with your wet hands or use a clingwrap. I follow Bakeling and reach your home. Thanks for sharing, and my kids love sushi and always ask me to prepare. I will try your recipe this weekend. Thanks for sharing, don't mind can you tell me where to get the mold? May I ask where can I get the mould? As I was reading your post, I was hoping that I am one of your kid to have a share of those lovely sushi! It jus look so yummy-delicious! My mum says that by not opening the lid when the rice is just cook.. it allows time for the rice to absorb the steam back.. making the rice nicer. (or something like that). But why drain and leave it for 30 mins? This I wonder why? Hi Anonymous, you can get the rice mould from Daiso. Hi lizziebeth, for the Japanese rice, you will need to wash and drain and leave it for at least 30mins...this way it will help absorb moisture...but Don't soak the rice with water. 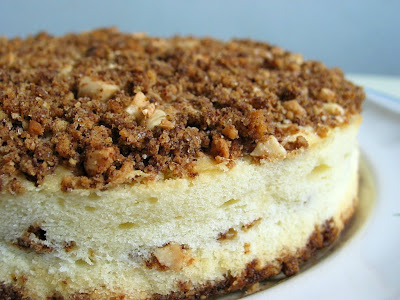 Hello, I came across you blog today by looking for photos for a pie. Your blog name caught me eye and I am very happy I stopped by. Your recipe here looks very easy and I will try it. Also I am very intrigued by your list of Simple Dishes. I hope to try the Baked Japanese Croquettes first. I am glad I stopped by and I hope to be a regular visitor! I love your spirit, turning an ordinary thing into something fun! You made me smile. Thank you! After I saw your picture of salmon onigiri, I went to daiso to buy the mould immediately. will also buy the ingredients for this weekend. Really admire your spirit! I made some salmon onigiri yesterday for my small cousin, but i added carrot, broccoli, celery, mushroom dices into the rice mixture to add more flavour. My cousin like them alot. Thanks for sharing this recipe. Hi Violet, your onigiri sounds so good!! Make this yesterday. I used the Calrose rice you recommended as above. I mixed in some sushi vinegar. I find the rice is more fragrance after the vinegar added into it. Yes, my son loves the onigiri very much! I need not have to feed him when onigiri ws served to him! Thanks for another lunch idea! Hi Min, it is always very rewarding when you see your little one enjoying the meals you prepare for him :) My kids love onigiri too! Hi HHB, I tried this on Saturday and my little one love it so much that he ate 3!! Thank you very much - photofunia is really nice site. Another site like this is Picjoke.com - funny pictures - they make a new effect every day! Oh this looks so cute, love it! I found your really appetizing Onigiri-Pictures via Google and I wanted to ask you If I could use one of the pictures for our student magazine?